Please find attached a letter from Toronto’s Medical Officer of Health, Dr. David McKeown, with regards to the discovery of Blacklegged Ticks in the city. These ticks can be infected with the bacteria that cause Lyme disease. The ticks have been sent to the National Microbiology Laboratory in Winnipeg for further testing – a process that could take weeks. 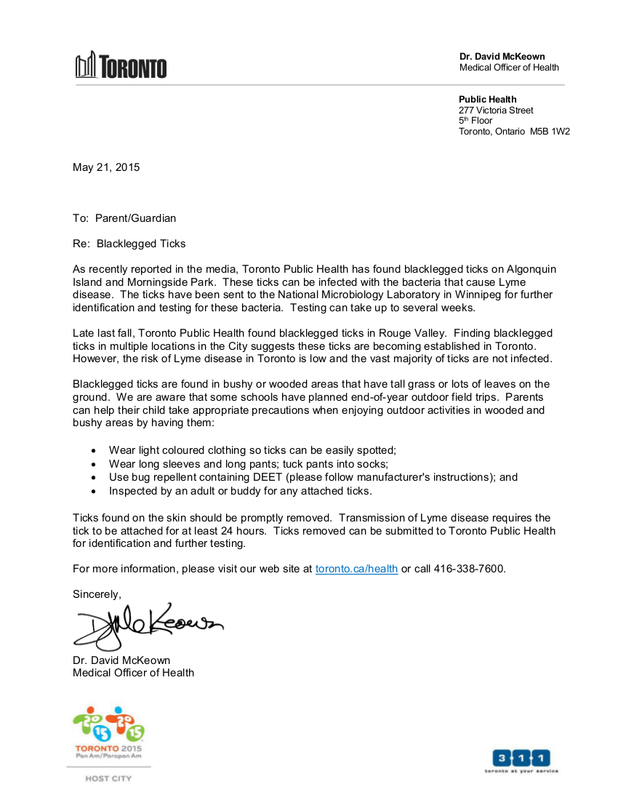 It’s important to note that the risk of Lyme disease in Toronto is low and the vast majority of ticks are not infected, but this letter is being sent out by Toronto Public Health as a precaution. Should you have any questions, please go to the TPH web site and the phone number listed in the letter. (Click on the image of the letter to download the PDF file.) Thank you.